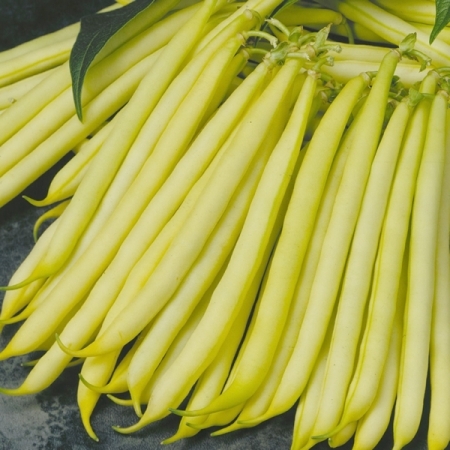 A beautiful high yielding and ‘easy to pick’ variety with straight golden yellow 13 cm pods. With a delicious flavour the beans are ideal used whole or sliced as a fine cut bean. Climbing French beans tend to be smaller than runner beans and have more tender pods. The immature pods are eaten whole, semi-mature pods are shelled and the beans inside eaten, mature pods can also be shelled and the beans eaten fresh or dried and stored like kidney beans. Climbing varieties can reach up to 2.5m in height and are best grown up canes. Dwarf French beans produce the same type of beans and pods as climbing beas and are used in the same way, but the plants are more compact generally about 45cm tall. Dwarf beans are good for growing in containers. Runner beans have a more pronounced flavour than French beans. 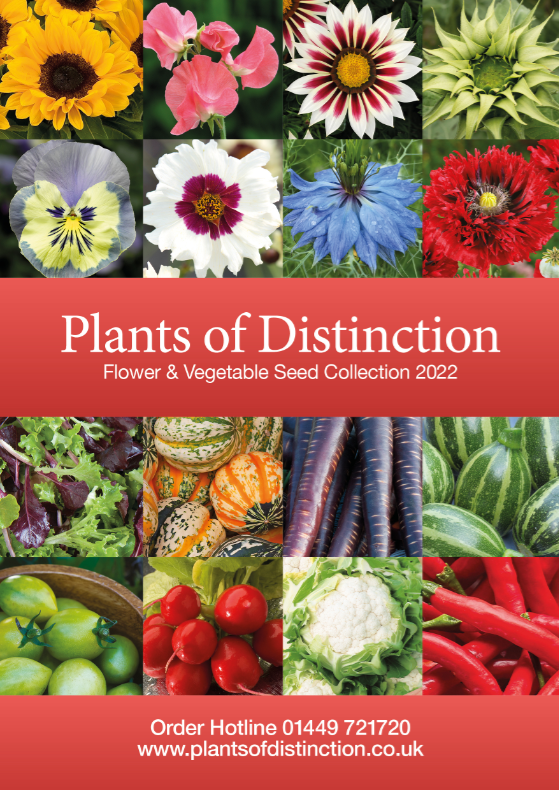 The plants are more prolific, some can grow up to 2.5m tall, and the beans produced are very long and flat. 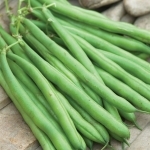 Dwarf runner beans produce beans like standard runner beans on very compact plants. Some varieties of dwarf runner beans are can be quite ornamental in containers. Quintessentially British, runner beans are one of the easiest of all vegetables to grow. To many people both summer and the vegetable plot would be incomplete without them. Bean seeds are large and easy to sow. They can be started indoors or planted direct into the vegetable garden but need warm conditions to germinate. Sowing bean seeds indoors gives a faster and more reliable germination rate, particularly for runner beans. At the end of April through to early May sow a single bean seed, 4cm or 1 and a half inches deep, in a 3 inch pot filled with multi-purpose compost. Seedlings will be ready to plant out after about three weeks. Before planting out, put them in a cold frame or a cool porch for a few days so that they can acclimatise to the conditions outside. 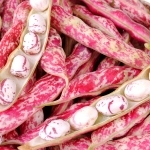 Alternatively, climbing, runner and dwarf beans can be grown from seed sown directly in the soil between the second half of May and the middle of June. Before sowing outdoors you will need to construct a support for your beans, wigwams or a double row of inward sloping 8ft canes are popular support options for runners and climbing beans. Sow beans outdoors from mid-May until July, 5cm deep, two seeds per support cane, spaced 15cm (6in) apart. After germination remove the smaller and less robust of the two young plants thinning to one plant per cane. As they grow, ensure the plants continue to twine around their canes and water well. Runner beans are particularly thirsty. Picking beans regulary and often will encourage a longer cropping period.